Last week I attended the media preview of the Washington Auto Show. With its dual focus on cars and energy policy, this is always a high point of the winter for me, even if this year's display lacked a draw of the magnitude of the pre-production Chevrolet Volt I drove at the 2010 show. Instead, I was pleased to find that the emphasis on fuel economy and technology in carmaker presentations was matched by a broad array of efficient and attractive new products. They still don't quite constitute the new car fleet needed for the 54 mile-per-gallon target the federal government requires them to meet by 2025, but in my opinion they're off to a very good start. No one listening to the presentations I sat through last Thursday could have missed the shift in focus from previous years. Performance and drivability were still mentioned prominently, but in most cases the innovations allowing those attributes to be delivered along with improved fuel economy, instead of at its expense, received top billing. I heard about Ford's nine models that achieve at least 40 mpg, including the new C-MAX Energi plug-in hybrid that received Green Car Journal's Vision Award for 2012. GM touted a number of efficient new models, including the upcoming Chevrolet Spark subcompact, which will later be available as a full EV. In some respects I found the 2013 Malibu Eco with "e-Assist" even more impressive: With the new Malibu and this year's Buick LaCrosse, GM is building family-sized gasoline-powered sedans that achieve 36 or 37 mpg on the highway. And thanks to Fiat's MultiAir technology, Chrysler had its new 40 mpg Dodge Dart on display. 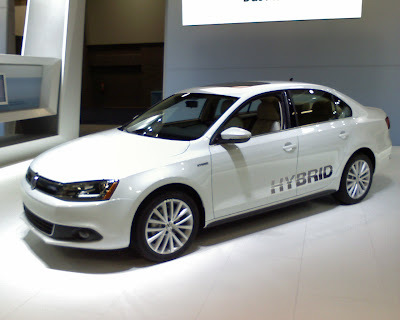 I was particularly interested in the VW press conference, where they debuted the 45 mpg 2013 Jetta turbo hybrid. The head of VW's US division introduced the car as part of his company's Think Blue sustainability drive, which with this latest model encompasses hybrids, clean diesels, efficient non-hybrid gasoline engines, and soon EVs. With all this technology to talk about, including the new, larger Passat sedan--where's the wagon?--built in VW's new Chattanooga, TN plant and sporting a diesel engine delivering 43 highway mpg (31 city), the biggest surprise was the amount of time he devoted to VW's partnership with Bikes Belong, a cycling safety group aimed at getting people out of their cars. That certainly reflects a bigger-picture view of vehicle sustainability. My visit to the car show also included a meeting with Lars Ullrich, marketing director of Bosch Diesel Systems North America, and Jeff Breneman of the US Coalition for Advanced Diesel Cars. They updated me on the progress that diesels have been making in the US market, particularly in light of the greater cost-consciousness of consumers, post-recession. In the last five years, the willingness of consumers to consider diesels has nearly tripled to around one-third, while diesel sales passed the 100,000 mark for 2011--still less than 1%, but about where hybrids were just a few years ago. Clean diesel models are expected to double by 2014. Models with announced future diesel versions include the Chevrolet Cruze, Jeep Cherokee, Dodge Dakota, and a Mazda crossover. Will diesels ever reach the level of popularity here that they've attained in Europe, where half of all new cars are diesel-powered? They must wage an uphill battle against fuel economy regulations that are anything but fuel-neutral, legacy perceptions formed by the dirty diesels of 20 years ago, and federal and state fuel taxes that still assume that all diesel fuel is used by heavy-duty trucks that wear out our highways. That's a shame, because this is a terrific technology that could be every bit as attractive to many consumers as more expensive hybrids. Another noteworthy item I gleaned from the manufacturers' presentations was that several of them are forecasting a return to annual US car sales of 16 million within a couple years. That would be good for the industry and employment, but it's crucial for shifting the fuel economy of the entire light-duty vehicle fleet. One of the unnoticed consequences of the low car sales of the last several years is that the US fleet has been aging faster, notwithstanding the small blip from the Cash-for-Clunkers program of 2009. The difference between sales of 16 million a yar versus 12 million is an average turnover of 15 years, instead of more than 20, and faster turnover should translate to quicker improvements in average mpg. For years we heard that the biggest obstacle to improving the fuel economy of the US car fleet was the auto industry, which only wanted to sell us big SUVs that carried higher profit margins. That excuse was always overly simplistic, and it has been relegated to the ash heap by a new generation of cars and light trucks featuring innovations delivering steadily improving efficiency, even in mainstream sedans and SUVs. Getting the entire fleet to 54 mpg won't be easy, but if what I saw at the D.C. auto show is any indication, the attainment of that goal now depends at least as much on sales mix as on the availability of efficient models. Within a few years, virtually every segment of the market will include hybrid, diesel and EV options that will put a big dent in both fuel bills and emissions, albeit at the expense of higher sticker prices. That means that future fleet mpg will likely be determined mainly by the decisions of consumers, rather than carmakers.